Flyer wheels are spinning wheels that wind on the spun thread automatically. The basic principle is that a loop of string (the drive band) runs over a big wheel (the drive wheel) and over one or two smaller wheels (the bobbin-whorl, the flyer-whorl or both). When you move the big wheel (generally by treadling), the drive band makes the flyer turn around the bobbin and twist the fibres. When bobbin and flyer turn at the same speed, the yarn is just twisted, but not wound onto the bobbin. For winding on, a speed difference is needed. 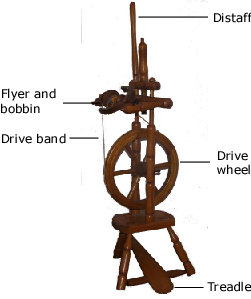 Drive the bobbin and brake the flyer - the result is a single-drive, bobbin-lead wheel. Drive the flyer and brake the bobbin - the result is a single-drive, flyer-lead (or scotch-brake or scotch-tension) wheel. Drive both flyer and the bobbin but use different size whorls for each - you get a double-drive wheel.